I have to confess something. When I first registered for last summer’s Lit Fest, a part of me fancied myself the big MFA-earning guy from Chicago, sweeping into sleepy Denver for a weeklong master workshop among the locals. I couldn’t believe I was getting a chance to work with Sarah Manguso, but I was also worried. I vacillated between being excited by the prospect and nervous that she might turn out to be one of those authors who, despite being amazing writers themselves, assess the work of others with about as much enthusiasm as a tollway attendant. In retrospect, I’m embarrassed by those thoughts. The prose we poured over that week, the words of my fellow workshop participants, added up to the best crop of manuscripts I’ve ever had the privilege to workshop. Each writer in that room put everything they had into their words, and all of us left far better writers because of it. I’ve never felt so challenged and inspired as I was by the workshop participants sitting around that table. Sarah Manguso—in addition to being a literary genius—was an incredible, caring, and deeply attentive workshop leader. Her teaching style mirrored her prose in its short but razor-sharp efficiency. She would make clear in a couple of sentences what others might’ve stumbled through ad nauseam. I’m so glad to have met and worked with her; whenever the words won’t come, I reread the notes I took during that week. 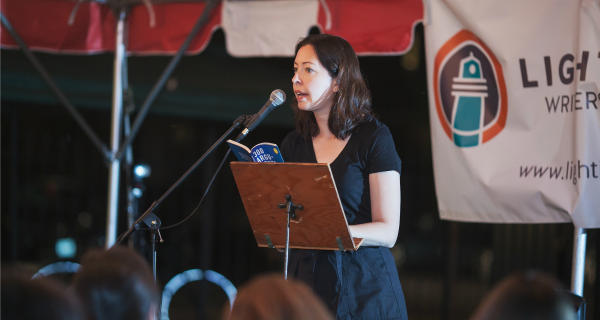 For me, the moment that encapsulates last year’s Lit Fest came the night Sarah read under the big striped circus tent. A handful of us from her master workshop sat together in the crowd. Our group had bonded by then—over our manuscripts certainly, but also during an impromptu outing to track down a great pizza place—and we let out raucous cheers at every opportunity. Sitting under that tent, surrounded by open-hearted writers from all genres and backgrounds, mentally exhausted from the hard work we’d all been doing in workshops, I was so proud to be where I was. I was proud to be doing the work, to have taken a chance on a new tribe and been welcomed so warmly, to have given my all and gotten it all back in return. I was humbled, to say the least, that things had come together in a way life rarely grants to any of us. The heat of the summer day was still in the air, and the string of lightbulbs lining the edge of the tent gave the space a sense of hushed intimacy. It was just us that night: writers, all of us there together, in our own small circle of light. Michael Fischer was a 2017 Lit Fest Fellow. His essays have been published in The Sun, Guernica, Brevity, The Rumpus, and elsewhere. This fall he'll be a Sutherland Fellow in the Ph.D. English Studies program at Illinois State.